The majority of Madagascar animals are endemic to the island. 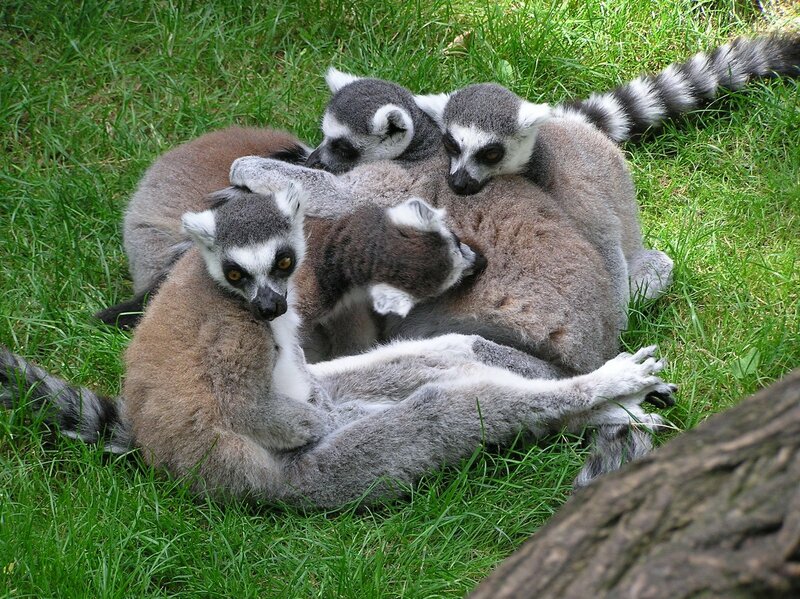 The most famous ones are lemurs - mostly nocturnal primates totally endemic to Madagascar Island. There used to be lemurs in central African rainforests, but they were replaced by higher forms of primates such as gorillas and chimpanzees. Today, lemurs are endangered both because habitat destruction, and because superstitious humans kill some species, such as aye-ayes. Other mammals include mongoose, fossas, civets, fanaloucs, tenrecs (hedgehog-like animals), moles, rats, mice and bats. It is very common on islands that there are no large mammals, and bats and rodents make up a large part (if not all) of native mammal species. It is also quite common on islands that there is a large variety of birds. Madagascar's birds include different species of asity, babbler, baza, buttonquail, buzzard, coua, emu-tail, flufftail, flycatcher, fody, goshawk, greenbul, ground-roller, harrier, harrier-hawk, hawk-owl, heron, hoopoe, ibis, jacana, jery, kestrel, kingfisher, lark, magpie-robin, munia, newtonia, nightjar, pelican, plover, rail, rock-thrush, sandgrous, scops-owl, serpent-eagle, shearwater, sparrowhawk, spoonbill, starling, sunbird, swamp-warbler, swift, tetraka, vanga, wagtail and weaver. Other classic Madagascar animals are chameleons. Although chameleons are found in many other parts of the world too, the vast majority of species are only found on Madagascar Island. Although some species inhabit deserts and grasslands, most of them live in rainforests, and are, as lemurs, threatened by rainforest destruction. Other Madagascar reptiles include many species of harmless colubrid snakes, and some boas, such as Madagascar ground boa and Madagascar tree boa; Nile Crocodiles, four species of turtles (including the famous Angonoka, Geochelone yniphora; and many species of skinks, geckoes and iguanids. Madagascar also has about 300 species of frogs and almost all of them are endemic to the island. Madagascar's frogs include the colourful mantella frogs (aka Golden frogs); the less colourful Mantidactylus frogs; many species of tree frogs, and genus Dyscophus (Tomato Frogs). And finally, there are millions of species of spiders and insects. Spiders include orb spiders, thorn spiders, trapdoor spiders, pelican spiders, wandering spiders, sac spiders, wolf spiders, tarantula spiders and many more. As many Madagascar's spiders, many insects (such as butterflies, praying mantids, moths and others) also grow quite large. This is often the case with rainforest insects.